Since version 1.0.398 we offer the ability to customize the BePro Listings search filter. While creating or editing a Form in the Form Builder, you can set certain fields as searchable. Once configured, the search filter will then only show search fields that you have set to searchable. Where BePro Listings search filter was once mostly static except for addons, our Form Builder has now made it dynamic. Now you can be in control of how users search your content. As with the stock fields, these new search filter options work with our ajax search features. Checkboxes have “OR” logic, so options that match any checkbox will show up. The search fields appear in the same order as they do in the Form Builder. Since the Form fields are easily rearranged, you have full control how users interact with your search features. We highly recommend that you only use the custom search filter, to search listings from its own Form. So if the search filter is set to Form 1, you should also set your search results to only show listings from Form 1. If you are using the bl_search_filter shortcode, you can specify a Form ID. This will use the search fields that you have selected as “Searchable”. Use these fields to search and filter through the listings. 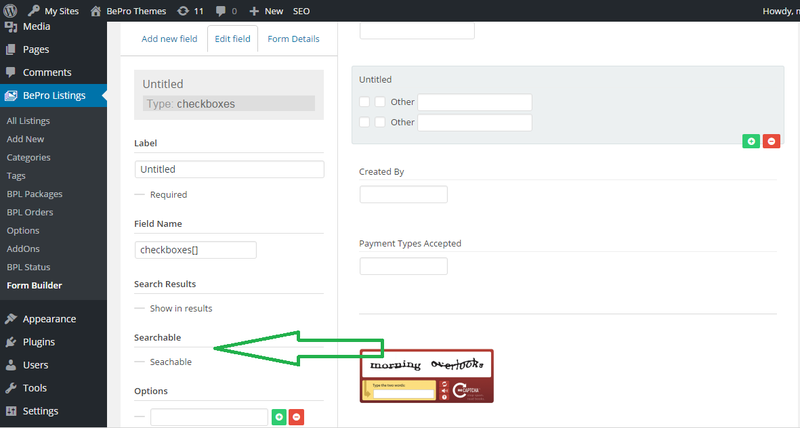 Here is an example where the FORM ID 2 is being used. Since the form builder fields are dynamic, we use string comparisons in the database. This is contrary to our niche addons which have purpose built database tables and static fields. With the convenience and flexibility of this new search feature, there is a performance difference as listing numbers increase. The ratio depends on your server setup (ram, cpu’s, etc). We created niche addons like BePro Listings Vehicles before the Form Builder. We did this because database tables designed for specific information, is the best approach in terms of performance. However, we encountered customers who preferred the ability to customize the content they were capturing and their ability to search it. The ability to change form fields has no performance impact; However, searches do. You may never experience this performance difference but you now know it exists.